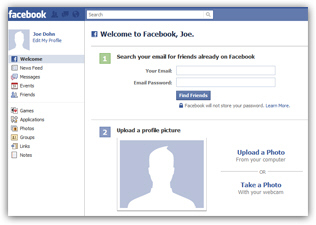 When you first create your Facebook account, you have the option to upload a photo from your computer, to use a "profile picture" on your public Facebook profile. If you have not, you can after the fact choose a picture for your profile, and likewise, you can change your Facebook profile picture at any time and replace it either with another photo from your computer, or another image from a photo album you have previously added on Facebook. In this tutorial, we will show you how to add or change your Facebook profile picture. The easiest way to add a picture to your profile is to click on the "Upload a Photo from your computer" link you see next to the section labeled "Upload a profile picture", which you can see in the screenshot above. Click on the "Choose" button below "Select an image file on your computer"; note that, depending on whether you are using Mac or Windows, the button label may say something else. Either way, a dialog box will open, and let you pick an image currently stored on your hard drive or external drives. Note that the maximum file size of 4Mb (4 megabytes) will allow even for a very high resolution picture of yourself; Facebook will display a "Uploading Picture" message for a (short) duration that depends on the size of the image you picked, and the speed of your internet connection. Once you have chosen an image, Facebook will automatically upload it, and use it as your profile picture. You will immediately see it instead of the generic profile silhouette; if you refresh your Facebook home screen (hit F5 on Windows, or Command+R on Mac), you will see your updated profile, now showing the profile picture others will see. This is the photo people will see when they find your Facebook account, and you are done! The next section shows you how to change your profile photo, and a later tutorial will explain how to delete photos from your profile and online albums. 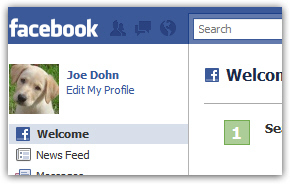 When you login to your Facebook account, click on the current profile picture. This will show you your profile as it more or less appears to others, with the profile photo in large size (the actual size that will be visible to other Facebook users who view your profile). You now have several choices: you can either choose "Upload a Picture" to choose another image file from your computer, and use it as replacement, or you can "Take a Picture" to use your display or laptop's webcam to use a photo of yourself at your computer, or pick "Choose from Album" to use another photo you have already uploaded to Facebook, and stored in a photo album. This is all it takes to add a photo to your Facebook account, or change profile picture! The next tutorial explains how to delete a profile picture, or hide it from all Facebook users or only a select few: delete or hide your Facebook profile picture.